LIBERTYVILE, Ill. (September 27, 2018) - After the 27-hole first day at the Merit Club, Ryan Anetsberger and Jon Shaver were sitting in a five-way tie for 9th place, with 0 points earned in the Stableford format. 27 holes later the pair from Glen Ellyn, Ill. found themselves on top of the leaderboard, champions of the 16th Merit Amateur. They did it on the strength of an 18-point final day (18 holes of best-ball Stableford in the morning, and 9 holes of Stableford aggregate in the afternoon), passing all eight teams ahead of them and gaining 9 more points than any other team on the day. Jim Arvanetes (Orland Park, Ill.) and Brian Payne (FLossmoor, Ill.), who were the first-day leaders with 9 points earned, played admirably the second day but fell three points short with 15 for the tournament. George Getz (Scottsdale, Ariz.) and Ben Hayes (Paradise Valley, Ariz.) added 7 points to their 4 point total from day one and finished solo third. The 2016 champs Steve Sawtell (Northfield, Ill.) and Michael Natale (Burr Ridge, Ill.) were fourth with 9 points. Drew Stoltz (Scottsdale, Ariz.) was a part of last year's winning team with partner Pat Moore. This year, Stoltz partnered with another fellow Arizonan Gregg Tryhus and finished 11th with 1 point. Two-time champion Chadd Slutzky (Deer Park, Ill.) teamed with John Ramsey (Glenview, Ill.) for a ninth-place finish with 3 points. 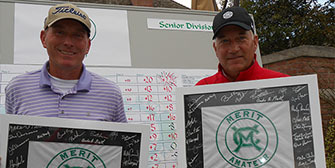 In the Senior Division, Chris Beto (Rockford, Ill.) won his fourth Merit title, but his first as a senior. He and partner Jeff Holmgaard (Loves Park, Ill.) took a three-point lead after the first day with 13 points, then added 9 more on Thursday to finish with 22 and a six-point win over Dan Dolan (Lake Forest, Ill.) and Alex Moore (Winnetka, Ill.). Beto won the Mid-Amateur division in three of the first four editions of the Merit Amateur, teaming with Jamie Hogan twice (2003, 2005) and Eric Burch once (2006). He becomes the first player to win in both the Mid-Amateur and Senior divisions. Two-time senior champion Dirk Anderson (Libertyville, Ill.) teamed with Steve Jacobs (Highland Park, Ill.) to finish third with 12 points. The defending senior champions, John and Steve Vernasco of Libertyville, Ill. and Fort Wayne, Ind., respectively, finished sixth with 8 points. Two day, multi-format event that features rounds of best-ball Stableford. 27 holes are played each day, with the final 9 holes each day the aggregate score of the two players. Handicap and age requirements are the same as for the USGA Mid-Am and the USGA Senior Am. Field limit to 36 teams and will be considered by playing resume. Merit Club hosted the 2000 U.S. Women's Open. To be considered for an invitation, visit www.meritamateur.com and fill out the invitation request form.